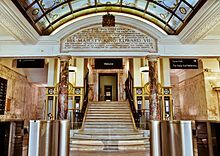 "The Polytechnic Institution in Regent Street, where an infinite variety of ingenious models are exhibited and explained, and where lectures comprising a quantity of information on many practical subjects are delivered, is a great public benefit and a wonderful place." ^ "QS World University Rankings by Subject 2014". Top Universities. 2014-02-20. Retrieved 12 September 2018.